Nothing beats Wellington on a Good Day! There is a saying that nothing beats Wellington on a good day, and it's so true. Reknowned for it's blistery, blustery days, Wellington is a true gem on a sunny day . Here's how I spent the day and made the most of the sunshine. Wellingtion boasts coffee brewers like Havana, L'Affare, Mojo and Flight. 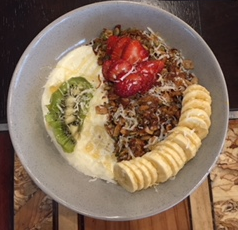 I started the day with a bowl of Granola and a cuppa at the Hangar on Willis Street. This highly rated cafe is worth the visit. Next I walked down to Lambton Quay and took the cable car up to the Cable Car Lookout. The cable car runs every ten minutes and climbs 120m in just 5 minutes. Take in the views from the top and visit the Cable Car Museum. Find Cable Car lane for the entrance to the cable cars. I took a leisurely walk back down to the city centre through the Botanic Gardens. There are different tracks to choose from with walks from half an hour. At the base of the gardens is the Lady Norwood Rose Garden which was named after Lady Norwood, the wife of the former Mayor of Wellington, Sir Charles Norwood. You can stop at The Begonia House and grab a drink from the Picnic Cafe. I continued walking through the Bolton Street Cemetery to the Beehive at the bottom. This is the home of NZ Government. From here I wandered down to the waterfront and stopped for lunch. There is a selection of cafes and restaurants to choose from. I spent the afternoon at Te Papa, a beautiful museum with rich exhibitions and then wandered down to Oriental Bay Beach. I wasn't brave enough to take a dip in the sea but many others were splashing about. In the evening there are many options for dinner. If you're visiting on a weekend, try the Wellington Night Market on Cuba Street. Nearby, Courtenay Place is great for entertainment and nightlife. Wellington has so much to offer! You sure can't beat Wellington on a good day!